Register at Foxy Bingo using the Foxy Bingo Promo Code to take part in the Welcome Bonus*, offering all new players a 300% bonus on their first deposit worth up to £150 plus 20 Free Spins on select slot titles. To learn more about the Welcome Bonus and what to expect when playing at Foxy Bingo, read the full review below. *Significant T&C: New players only. Min. deposit £10, max bingo bonus £150. x4 wagering requirements apply to Bingo bonus, expires in 30 days. Free spins awarded on deposit, expire in 7 days. Further T&Cs apply. *Foxy Cubs Key T&C: Funded players only. Eligible for first 3 days after joining. £7K monthly total. Winnings credited in bingo funds, x4 wagering applies. T&Cs apply. **2k Spooky Slots Tournament Key T&C: Funded players. Opt-in req. Min wager £10. Selected slots qualify. 1. Point per £10 wagered. Credited as real cash. T&Cs apply. ***Funded players only. Min 1 card. Max 96 cards. 75 Ball room. Real cash wagers only. Credited in cash. T&Cs Apply. Click on the button following this list. Fill out the registration form and apply the Foxy Bingo Promo Code in the respective field. Verify your account via e-mail. Make a qualifying deposit into your account using one of the many payment methods available. The bonus money and free spins will automatically be credited into your account. Users must be over the age of 18 and new to Foxy Bingo. The Foxy Bingo Promo Code must be applied during registration. A minimum deposit of £10 is required to activate the bonus. (T&C Apply). The maximum amount that will be awarded is £150 on a £50 first deposit. (T&C Apply). A 4x wagering requirement must be fulfilled before users will be able to withdraw bonus funds from their gaming account. The bonus is automatically forfeited if not used within 30 days. The 20 Free spins can be redeemed on Fluffy Favourites slot games only. (T&C Apply). Free spins expire 7 days after being awarded to a player. General terms and conditions apply. Please see significant T&Cs above. The Foxy Cubs promotion* is available to all newcomers to the platform who make a deposit of £5 or more. 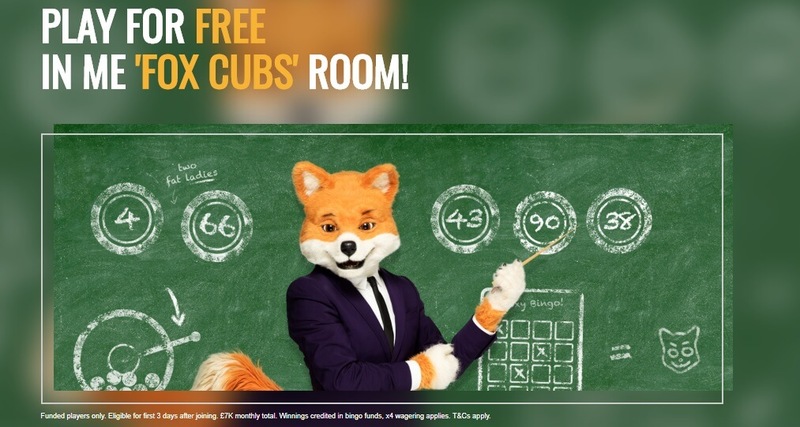 To activate the Foxy Cubs promotion new users must go to the ‘Specials’ tab and play free games found in the ‘Foxy Cubs Room.’ Prizes will be awarded to new players from a £7k+ prize pool each month, with a maximum of £250 available each of the first three days at Foxy Bingo. No Foxy Bingo Promo Code will be required to unlock this promotional bonus. 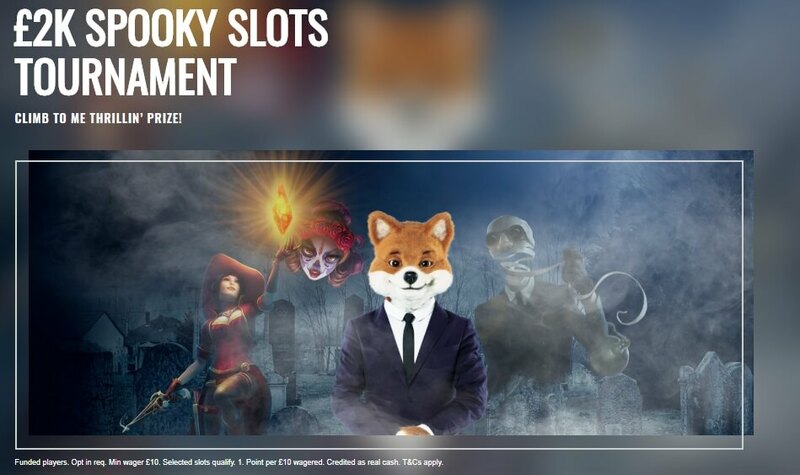 With the 2k Spooky Slots*, Tournament players may opt-in and grab their share of the prize pool by making the Foxy Bingo Tournament Leaderboard. First place prize is £700 and places all the way up to 20th get paid. To activate this promotional offer you will be required to visit the ‘Promotions’ section and click on the ‘Opt in’ button. No Foxy Bingo Promo Code required. *2k Spooky Slots Tournament Key T&C: Funded players. Opt in req. Min wager £10. Selected slots qualify. 1. Point per £10 wagered. Credited as real cash. T&Cs apply. As you’d expect the Foxy Bingo Casino focuses a great deal on bingo games. Players will have their choice between a number of different bingo rooms which include both 90 Ball and 75 Ball versions of the game. Card prices vary from room to room from anywhere between 5p to 25p on real money games. A number of free bingo games are also available. Side games are available in most of the slot rooms, known for providing users with slots and instant win games which complement the bingo rooms. The Foxy Bingo Big Jack O’Pot is currently available which gives users the opportunity to win a £7,500 cash jackpot with as little as a 25p entry! Funded players only. Min 1 card. Max 96 cards. 75 Ball room. Real cash wagers only. Credited in cash. T&Cs Apply. A range of slots, table games and instant scratchcard games are also available at the Foxy Bingo Casino. Slots, in particular, are extremely popular with top software manufacturers such as IGT, WMS, NetEnt, and NextGen Gaming supplying a majority of the slots titles. Some of the most popular slots games at the moment are Starburst, Cleopatra, Rainbow Riches, Twin Spin, and Foxin’ Wins. In terms of table games Foxy Bingo includes all the favourites such as BlackJack, Roulette, Baccarat, Casino Hold’em and Caribbean Stud Poker, along with top video poker titles such as Aces and Face & Deuces Wild. Ten scratchcard games are available for instant play including the exclusive Foxy 7×7 game and the big jackpot Cash Buster Towers and Big Money Slingo. Most of the table games available at Foxy Bingo are also available in the live dealer format to give users an in-person casino experience. Live Games are mainly powered by NetEnt and Microgaming, making for a top streaming experience that incorporates a wide range of betting stakes and quick action dealing. High-speed internet is required to stream live casino games in high quality without interruptions. Foxy Bingo Mobile App is available for users with an iOS operating system. Users will be required to have iOS 8.0 or later and be using an iPhone, iPad or iPod touch. There is no mobile app for Android devices; however, users will be able to access the platform via a mobile browser client on all mobile devices. The mobile app gives users access to all the bingo games and select slots titles. Scratchcards, table games and live casino games will not be available for play via the app. The main advantage of using the mobile app is the ability to get notifications for your favourite bingo games and the ability to play from wherever you may be. Special mobile bonuses are available from time to time for mobile players. To download the Foxy Bingo Mobile App users may visit the iTunes store. Alternatively, users may use the casino platform by simply visiting the Foxy Bingo website on their mobile browser and logging in. Deposits are generally instantaneous at Foxy Bingo with no fees taken by the site. Withdrawals can take between 48-72 hours to be deposited into a user’s bank account or credit card. 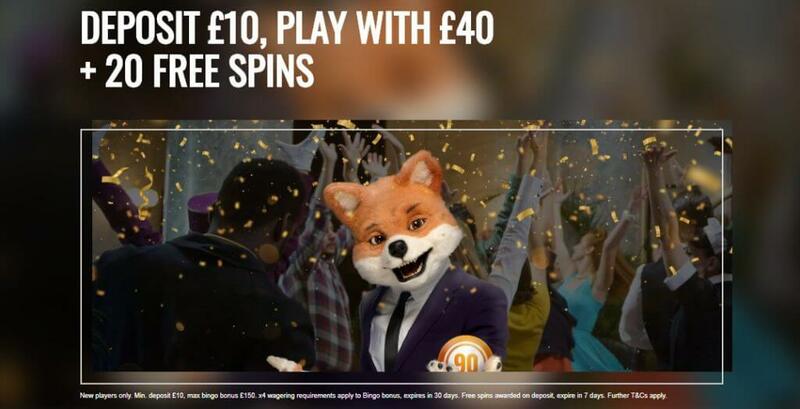 The minimum deposit from any method onto the site is £10, keep in mind that a minimum of £10 is required to activate the Welcome Bonus with the Foxy Bingo Promo Code. (T&C Apply). Limits can be increased following a review of play and account history. Users may contact the Foxy Bingo Customer Service Team via Live Chat, Telephone or Email. Email – Users may send any questions they have into info@support.foxybingo.com and the customer support team will try to get back to you within 48 hours. Phone – If a user is located in the UK they may call the support team on 0800 279 4501 or, if they are outside the UK, they may call the team on +44 0800 279 4501. The support team will be available to take calls between 6 am and 11 pm from Monday – Sunday. Live Chat – Users can always access support team representatives via Live Chat by clicking on the ‘Live Chat’ button in the help section of the website. Foxy Bingo offers a competitive casino experience that is highlighted by its bingo rooms. With dozens of rooms available throughout the day in both 75 and 90 Ball format users can enjoy Bingo games from home on even their mobile devices. The casino games collection also includes many slots and table games along with a live casino to complete the gaming experience and create a games cache which rivals most top casinos in the region. Where the site seems to be lacking is in the inability of users to play table games and live casino games on the mobile app at the moment. Is the Foxy Bingo Promo Code currently available? Yes, a Foxy Bingo Promo Code can currently be used coinciding with the Welcome Bonus. Any UK-based player who is over the age of 18 may claim the Foxy Bingo Promo Code Offer. There is currently no mobile bonus, however, users may sign up via mobile to claim the current Welcome Bonus. Can I claim the bonus in addition to any other existing offers? The Welcome Bonus is not available in conjunction with any other bonuses. In some cases, a bonus will be compatible with the Welcome Bonus. In this case, the bonus will specifically say so. If you are unable to claim the bonus you may contact the Foxy Bingo customer support team for help via Live Chat, Telephone or Email. Alternatively, a FAQ section is available on the site to help with any issues.